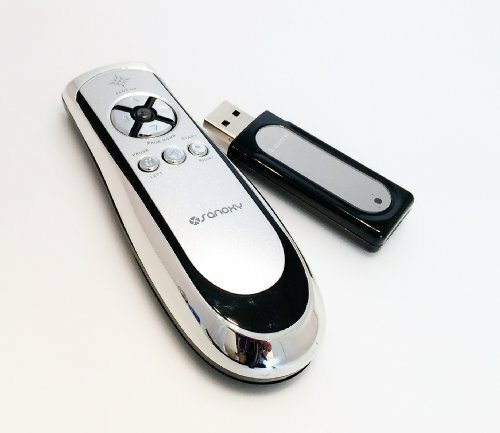 Smart-Pointer 2.4Ghz RF Wireless Presenter with Mouse Function and Pointer enables you to control your onscreen presentations within a range of up to 100 feet, making it the perfect tool to use in a large conference room. The presenter supports the most common PowerPoint presentation functions including Page Up, Page Down, Mouse Arrow, Right Click, Left Click, Darken Screen, and Resume Screen. It also has a laser pointer built-in to help your audience focus on key points of your presentation. The compact and lightweight design lets you control your presentation with ease as you present. Just plug and play and you are ready to go - no software is required. No need to aim the transmitter to the receiver. Safety warning: Presenter Pointer is not a TOY and it should not be directed to people's eyes.